Here is a meatball sub recipe we first started making to use up leftover meatballs, and now anticipate as much as the original meal. We love to make homemade spaghetti and meatballs, but it makes a bunch of meatballs. We will often have some leftover, which no one complains about, because it just means we can have some for lunch the next day. To mix it up a bit though, I decided to use the leftover meatballs to make these sandwiches instead of just warming up sauce, meatballs and more spaghetti. I have to say, these subs were a big hit, and we are already planning to make a double batch of meatballs sometime, to allow more sandwiches in the future for a party. * We use the meatballs we already have from making out spaghetti and meatball recipe, and you can do the same, or make the meatballs specifically for this recipe instead. Here is the meatball recipe again. Some additional optional ingredients that we have considered, but haven't added yet, are sauteed onions and peppers, which would be really yummy, I think. Reheat your meatballs, if you are using leftovers, since you will use the oven mainly to toast your bread a bit, and melt cheese. Cut your sub rolls in half, and place on a baking sheet. Cover one side of the bread with cheese and the other side with 4-5 meatballs (or less for children). Cover with sauce and sprinkle with parmesan cheese. 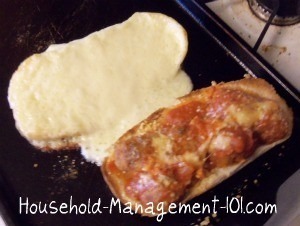 Place in the oven until the cheese is melted and the bread is beginning to get toasty. We sometimes stick them under the broiler for a minute or so, to brown the cheese a bit. Let them cool slightly, so the melted cheese doesn't burn your tounge, and then enjoy! A simple way to turn leftovers into something delicious and highly anticipated all on its own. You gotta love that!